Glamorous lace will add a new level of elegance to your overall look in headwear. Learn from Master Milliner, Brett Morley of Melbourne how to create refined silhouettes in lace to create a sensation on the bride’s big day or as your next Fashions on the Field race day entry. In this Course Brett shows you step by step how to bring the lace to life in four different graceful styles. Techniques are explained on how to retain the true colour and texture of your lace as no stiffener is used, plus you are able to tweak lace into desired position. Include timeless lace styling in your new collection. Elegant silhouettes, ornate hand-crafted individual leaves and delicate petals for soft feminine glamour are the basis of Melbourne milliner, Brett Morley's collection. Modern millinery techniques and classic craftsmanship combine to create unique and special pieces. With a bold colour palette, Brett's passion and expertise is evident in every piece he creates. Starting his career as a hair stylist, the transition into millinery was natural and fitting. Learn the detailed basics on how to compose your lace pieces to bring them together to form feature flowers on your headband. No stiffening is required to maintain the graceful touch of lace to your bespoke headwear. Brett Morley shares his skills to create a dramatic headpiece ready for the world stage. Learn how to use the quill in the design process and refine the binding of all components to execute a perfect finish. 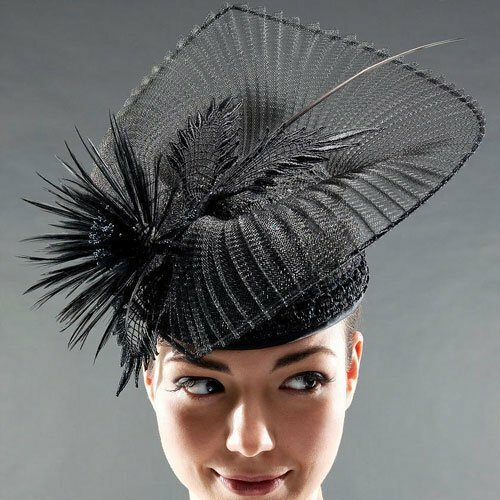 Lace and crinoline are a perfect combination for this upturned brim hat. Clients who love to add height when wearing their headwear will enjoy the delicacy of this freeform pleated crinoline brim hat. Lesson support includes online contact with tutor Brett Morley to ask lesson specific questions and feedback. Poupee - Cloth Head with free shipping.